PAPUA New Guinea’s mining and petroleum industry is providing sustainable food solutions across mining communities. Wafi-Golpu Joint Venture recently trained 39 women from Hengambu, Yanta, Babuaf and Wagang villages in Morobe on food preparation. The training was conducted by the National Agriculture Research Institute (Nari) in Lae. Papua New Guinea Chamber of Mines and Petroleum executive director Albert Mellam said the initiative was an example of the widespread agricultural support mining and petroleum companies in Papua New Guinea were delivering to local communities. The programme was designed to improve food preparations and storage capabilities that enabled common ingredients such as sweet potato, banana, taro, yam and cassava to be stored for a longer period, thus guaranteeing access to food between harvests. “Throughout PNG, resource companies are working with communities and non-government organisations to deliver seeds, tools and training,” Mellam said. Oil Search spent about K1.1 million (US$344,000) on drought relief assistance programmes last year. It also worked with Nari to introduce drought-tolerant crops for farmers. Ok Tedi Development Foundation announced the launch of a new project earlier this year, in collaboration with Innovative Agro Industries. 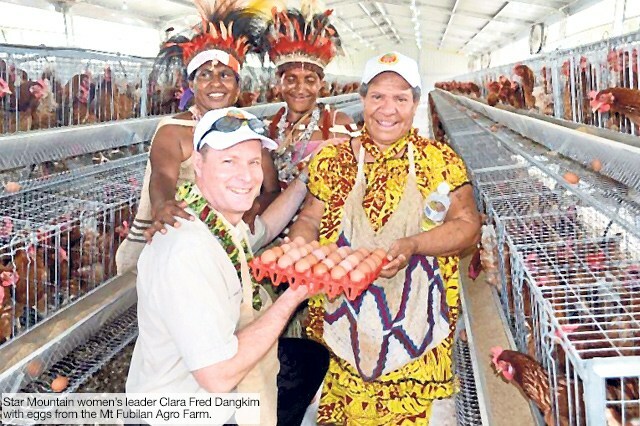 It would give six landowner villages in Western the ability to produce more than 3.6 million eggs and 26,000 broiler chickens a year through the development of chicken sheds, feed mills and other associated facilities. From an agricultural business perspective, resource companies were major clients within Papua New Guinea’s growing agriculture industry which was giving opportunity to farmers to supply their produce. The Hidden Valley mine buys its fresh produce from local smallholder vegetable farmers in the area through local company NKW Fresh, which supplies fruit and vegetables directly for the mine’s catering service after buying from the local vegetable farmers.